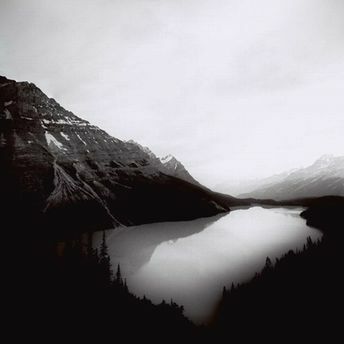 Banff National Park offers several iconic photo locations but most visitors overlook this location. Download free directions, maps, GPS and photo advice for Peyto Lake by selecting the Maps and Directions tab above. Turnoff on Bow Summit Area road (mile marker 40) of The Ice Field Parkway Map, park in the bus/rv parking area. This is the shortest walk to the Peyto Lake overlook and trail access. From the parking area to the trail access is a few hundred feet. Parking area to the photo location is approximately .7 miles with an elevation change of –800ft. Take the trail access (about 70 feet before the overlook) towards the base of the lake, .5 miles into the hike you will see a cleared area from avalanches on the left side of the trail. This offers the only vantage point to photograph the entire lake. The footing is solid enough to gain a few hundred feet in elevation to frame the shot. The best time to photograph Peyto Lake is from sunrise until 11am. During sunrise pink clouds are common with cloud reflections in the water. Closer to 10am the sunlight turns the lake water a turquoise blue, which makes for nice pictures as well. 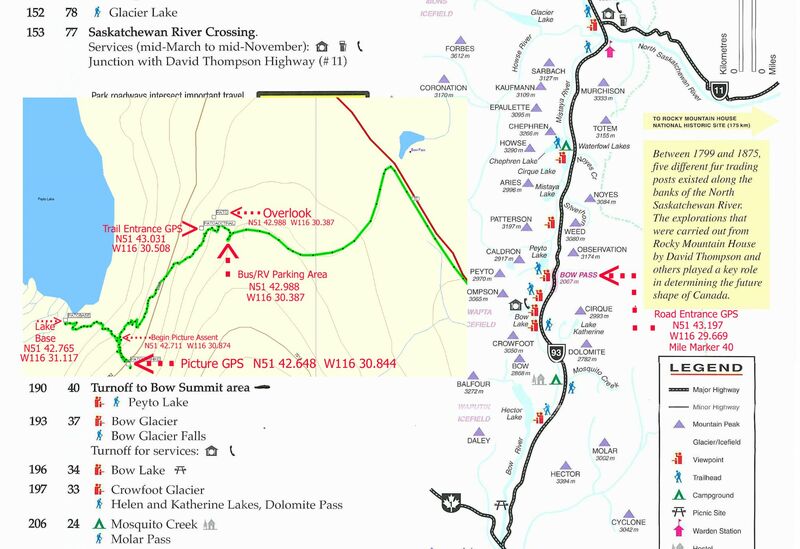 The Ice Field Parkway Map is available under the PPS Resource page. For Google Maps driving directions to Peyto Lake click the green "View Map" icon and then select "Get Directions" in the upper left hand corner of Google Maps. Photo: Hasselbald 503cw 40mm lens Kodak 160vc July 2008.